The bots will scrub floors without human supervision. Robot janitors could be coming to a Walmart near you. On Monday, a robotics company called Brain Corp — seriously — announced it had entered a partnership with the big box chain. By the end of January 2019, the tech company will equip 360 of the retailer’s floor scrubbing machines with a platform called BrainOS. If all goes according to plan, the machines will keep the store’s floors spotless — without the supervision of a human employee. Typically, Walmart workers must manually operate the company’s floor scrubbers, guiding them down the various aisles every time a store needs cleaned. But according to a Brain Corp press release, a Walmart employee will simply need to ride each BrainOS-equipped floor scrubber around the store once to map the building’s layout. 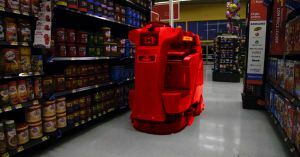 After that, the scrubber will be able to navigate the store autonomously, using a system of sensors to keep an eye out for people and obstacles. The goal, according to Walmart, is to free employees of the tedious task of cleaning floors so they can focus on other parts of their jobs, such as helping customers. If that is the case — and these robot janitors don’t actually cost any workers their jobs — they could improve the Walmart experience for both customers and employees. But there’s also a chance that the collaboration could be a stepping stone along the path to robots that can do all the tasks of a Walmart worker. And given that Walmart employs more Americans than any other company, it’s hard to overstate the impact that could potentially have on the economy. Autonomous Robot Bees Are Being Patented by… Walmart?